Today marks 50 years of my political education. The events of April 9, 1969, helped make me who I am today and the university what it is. 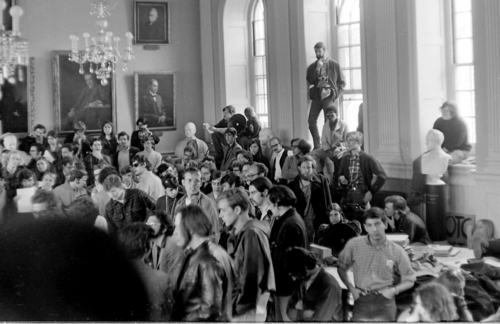 I was a sophomore in college when my fellow students at Harvard University decided that politics, especially the war in Vietnam and the presence of a military training program on campus, compelled them to take over the main administrative building, called University Hall. Students leading the charge atop the steps of University Hall. © Daniel Pipes, 1969. Although opposed to this action, I joined the Communists in University Hall to witness the uprising first hand and take pictures. My photographs reveal about 250 students packed into the august President's and Fellows' Room, harangued as they disrespectfully stood and sat among its statues and under its portraits reaching high to the ceiling. Students in the President's and Fellows' Room. © Daniel Pipes, 1969. The mood was triumphalist: Finally, students had taken matters into their own hands and showed those deans that they mean business! Flexing their muscles, the students escorted establishment lackeys out of the building, rifled through their files, and announced to humanity the dawning of a revolution. 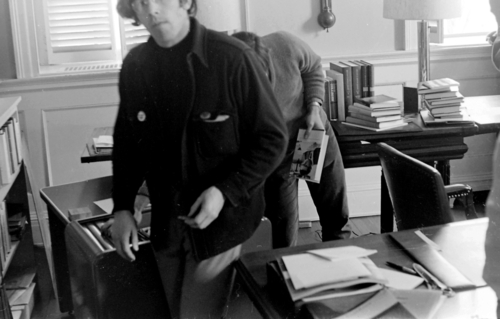 Students pilfer the office of an administrator in Harvard's University Hall. © Daniel Pipes, 1969. Only, the revolution did not dawn. About 400 policemen entered University Hall at 3 a.m. and reminded the 500 students inside who the real boss was; that would be Harvard's president. Letting off some righteous proletarian anger at the expense of pampered student radicals, the "pigs," as they were then infelicitously dubbed, ignominiously beat and carted off the play-revolutionaries to jail. That began the real crisis. 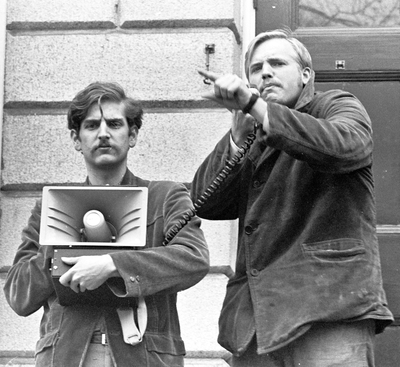 For reasons that a full half-century later still escape me, the consensus of Harvard's good and wise was that, while the students may have gone overboard in their idealistic fervor, the university's administration had gravely sinned by calling in the police. The "bust," not the "occupation" became the paramount issue. Eight days of crisis followed, including one meeting in the university church and two in the football stadium. 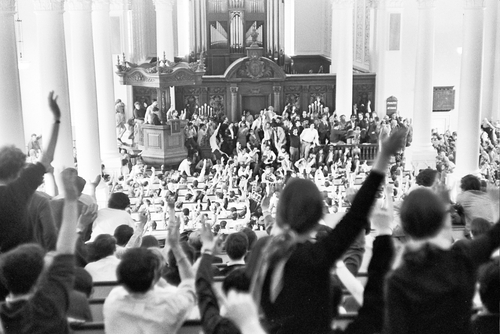 The latter were unusual experiments in direct democracy, at which some 10,000 men of Harvard (plus its women, to be sure), myself among them, yelled out "yes" and "no" to questions about closing or opening the university. Students vote early overwhelmingly in Memorial Church on Apr. 10 for a 3-day shutdown. © Daniel Pipes, 1969. In brief, the first meeting called for a three-day shutdown ("strike" in student parlance), the second for a re-opening. And so, after ten days of unadulterated politics, debating topics as small as Harvard's role as landlord and as great as U.S. atrocities in Vietnam, the university returned to a normal schedule. 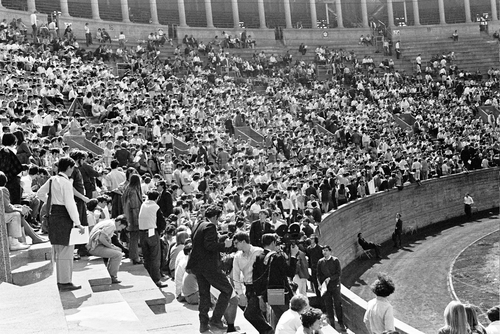 Students at the first Harvard football stadium meeting on Apr. 14, when they voted to continue the shutdown for three more days. © Daniel Pipes, 1969. Normal schedule, but not normality. This event, and its equivalents across the country, caused a deep shift in the nature of American higher education. What had since World War I been a liberal institution (recall William F. Buckley, Jr.'s 1961 quip, "I would rather be been governed by the first 2,000 people in the telephone directory than by the Harvard University faculty") now began its sad decline into radicalism. 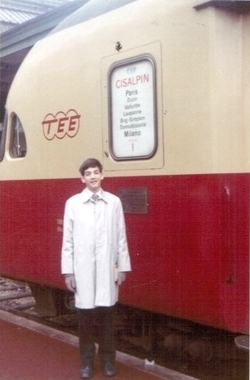 Daniel Pipes in Paris, November 1961, on his way to boarding school in Lausanne. The would-be revolutionaries of the late 1960s went on to change the fundamentals of American academic life, eventually bringing on such delights as women's studies, political correctness, micro-aggressions, and intersectionality. That descent still continues, not only with far-leftists almost everywhere dominating the humanities and social sciences, but with their radicalism growing more intense and intolerant. That takeover and bust culminated my political education. I emerged from high school in 1967 without strong views on the burning issues of the day. Even before the bust, I favored an American victory in Vietnam; but the Harvard tumult permanently consolidated and directed my views, making me the dedicated conservative I am today. The bust also prompted me to fathom why I had isolated myself among the tiny minority of student anti-Communists. I concluded that my foreign experience in Europe, the Middle East, and Africa had caused me to appreciate the United States as most of my peers did not. My generation came of age in the halcyon 1950s; so, when great issues appeared in the next decade (assassinations, Vietnam, civil rights), it responded with outraged disappointment. But not me, for I knew the outside world. National Review played a role in firming up my view. When long-time publisher William Rusher visited Harvard in December 1968, I joined a small (of course!) group of students to hear him, mostly out of curiosity, for conservatism was wildly exotic. Yet he was convincing, and I then became an NR reader. 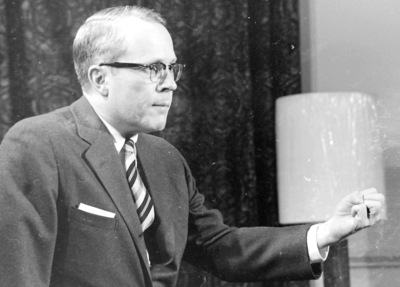 NR publisher William Rusher (1923-2011) speaking at Harvard. © Daniel Pipes, 1968. The Harvard bust radicalized the university but turned me into a conservative. Its legacy is wretched, but not for me. Daniel Pipes (DanielPipes.org, @DanielPipes) is president of the Middle East Forum. © 2019 by Daniel Pipes. All rights reserved. April 9, 2019 addenda: (1) As a historian-in-the-making, I took 400 pictures of the events described above. They sat for 50 years as undeveloped negatives. I recently scanned them, turned them into positives, included a few above, and posted them all here. Also, I systematically collected hand-outs and posters of Leftist activities throughout my college years, 1967-71, and this archive sits in my basement. If interested in institutionally housing these papers to serve as a primary source, contact me at Daniel.Pipes@gmail.com. 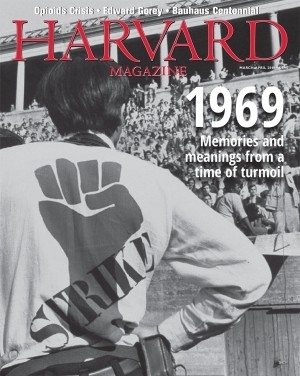 (2) Harvard Magazine's March-April 2019 issue celebrates the events of 1969. When will they learn? (3) I recently offered an antidote to the problems that started in the 1960s, at "Repairing America's Broken Universities." 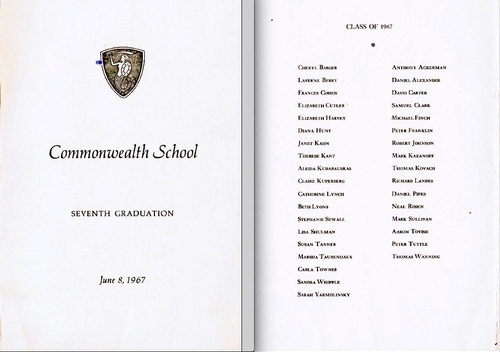 I graduated from Tufts Medical School in June 1968 and started a rotating internship at Harvard's Cambridge City Hospital on July 1. On April 10, 1969, I was the intern running the Cambridge City Hospital emergency room and arrived that day at 7 AM, at the same time as several busloads of injured prisoners under a very relaxed police guard. For prisoners, they were well-dressed, exceptionally cooperative, pleasant, well-spoken, intelligent, and even helpful: the opposite, in short, of the usual belligerent alcoholic I saw at that hour. They all required the usual neuro check and skull X-rays, which took several hours. They politely waited in a long series of chairs along the corridor wall. There was minimal police presence for surveillance, and none was needed. No one watched and no one 'escaped"! Most had minor head wounds from police batons, and I remember thinking, considering other head-baton injuries I'd seen, how minimal those injuries actually were. I came to learn they were all Harvard students. I concluded from the restrained police response that a civil disobedience had taken place, not a revolt. (I later found out that the only serious injury had been to a woman who fell out of a second-story window – and that she was not even Harvard related.) By about 11 AM, everything was finished and they left. Only later, on learning about the Harvard revolt, did I realize I'd been a small part of the story. I have never since enjoyed the company of such a large group of so easily-managed prisoners. Comment: Apparently, the police were not so tough, after all.